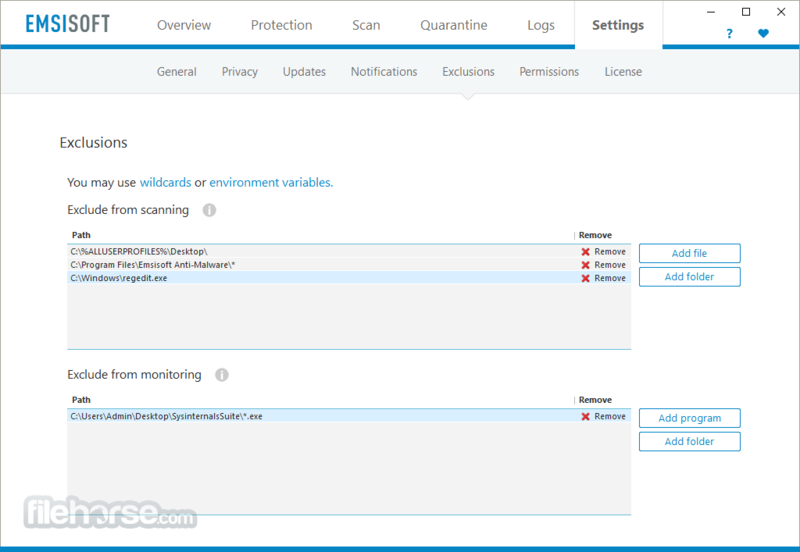 Emsisoft Anti-Malware is fueled by a dual engine malware scanner for twice the malware cleaning power, with no extra resource requirements. On top of that, Anti-Malware can even remove potentially unwanted programs (PUPs) that overload your computer with resource wasting bloat. 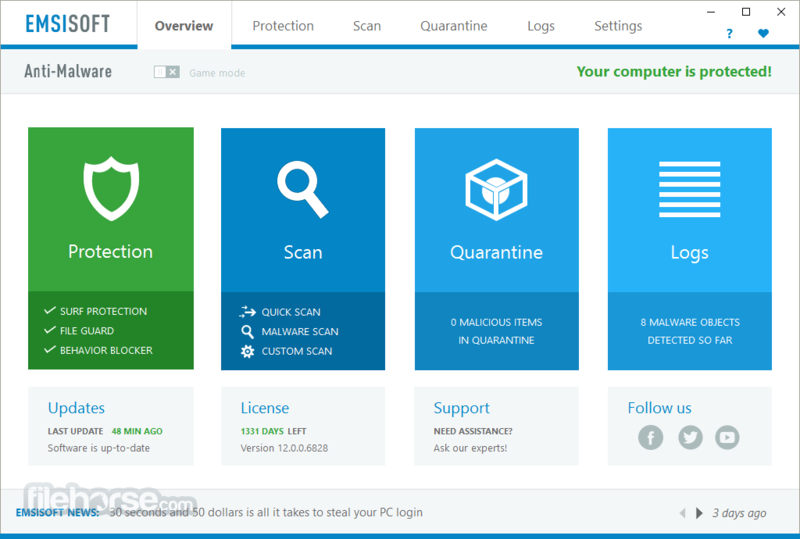 Altogether, that guarantees superior detection, efficient removal, and a clean Windows operating system where you’re completely Malware-Free. The program is designed to use as few computing resources as possible. That’s because your computer is a lot like you. Just like you, it can only perform so many tasks at once, and if it gets overloaded it will crash. 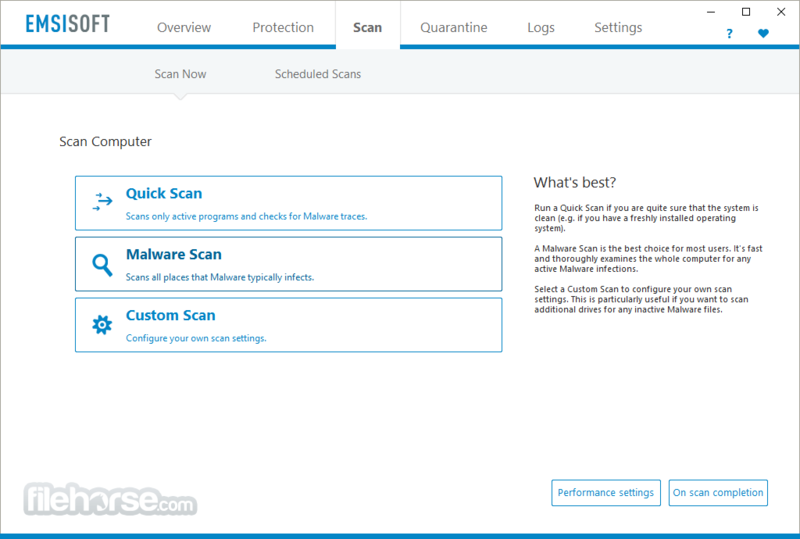 Emsisoft Anti-Malware combined two of the best virus and malware scanning technologies in the industry at the lowest level possible to ensure optimum detection rates and maximum speed. The result is a user-friendly anti-malware that completely protects your digital life and leaves the computer’s power exactly where it belongs: with you. If you unintentionally try to access a website that spreads trojans or spyware, the software will prevent you from doing so. The built-in list of known dangerous and fraudulent websites is automatically updated every hour. This crucial layer of protection checks all files that are downloaded or run against more than 10 million signatures of known malicious software. The program file guard is intelligent and self-optimizes continually, so you won’t feel the impact of dozens of files being scanned in the background every second. To catch zero-day threats that aren't yet included in the signature database, anti malware tool continually monitors the behavior of all active programs and raises an alert as soon as something suspicious occurs. Combined with the live cloud-verification of the emsisoft anti-malware network it is ultimate weapon against specialised and sophisticated malware attacks that others can't protect you from.